A disability charity, United Response, is inviting the public to come along to a special four-week-long photography exhibition showcasing Torbay talent. 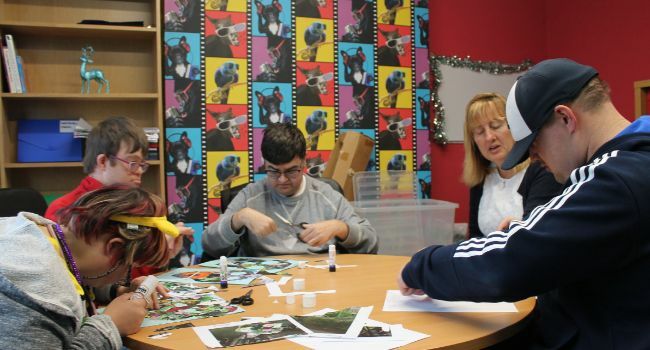 United Response’s ROC Creative is one of the south west's leading art projects, providing an environment for people to express themselves artistically whatever their ability. All of the displayed work – including videos, photos, sketch books and character portraits – have been made by people with learning disabilities, Down’s syndrome, or autism. The free-of-charge exhibition shows how creative people with disabilities can be. Hope Trimmer, United Response photography learning guide and support worker, said that "the outcome of the project was a set of character portraits and a short film from each group of people we support. We wanted members of each group to have a go at the different roles within photography and film including acting, camerawork, editing, creating characters and a story and costume and set design. ROC Creative Torbay is a project in which people with disabilities will be taught by specialist practitioners with a wide range of arts interests and professional experience. They can make friends in the community and work towards accredited learning qualifications in arts specialisms such as photography, media, music, samba, dance, drama, and art. Hope added: “We wanted to show Torbay the creative power and talent of people with learning disabilities and for them to be able to express themselves. This has been an amazing project – both for the people taking part but also for our staff too. We’ve been awed by so many imaginative ideas and some quirky, left-field and off-the-wall stuff too. The exhibition is open from 9:30am every day until the 20th December. Visit www.unitedresponse.org.uk/roc-wellbeing to find out more about United Response’s ROC Creative.